One of the greatest parts of the smartphone is listening to everything on a single device. We listen to streaming music, podcasts, Audiobooks and even YouTube videos. Most people listen on headphones or headsets while at work or home. 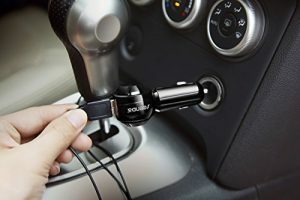 When driving, we can use Bluetooth to connect to the car stereo. What happens then if your car does not have Bluetooth? Bluetooth head units are expensive, even for the most basic models. Now, there are Bluetooth to FM transmitters. Much like the MP3 FM transmitters popular in the 90’s, there are transmitters for smartphones. They are widely available and you can pick one up from any online shopping website. This is how it works: Plug the unit into the car’s lighter port. Once it powers up, set a frequency to use for transmission. Tune the FM radio in the car to that frequency. Ideally, choose a frequency that has no actual radio station on or close to the same frequency. Enable Bluetooth on the phone and pair with the transmitter. That is it. Now any audio on the phone will come through the car stereo. Some of these transmitters will handle phone calls as well using a small built-in mic. An option on the paired smartphone will decide whether to route audio to the car or the phone. The quality levels are better than radio and are more than adequate to listen to music, which is great considering the online shopping discount. In addition, some come with USB charging ports and extend the charging port itself. This is the best possible option available for those who own older cars and do not want to make the investment of a new head unit.